Are you looking to rent a party bus in Livonia, MI? If you are, then allow us to introduce ourselves. We are Rockstarz Limousine and Party Bus, and we have years of experience within the industry and can guarantee you that both you and your party will have an amazing time with us no matter what the celebration may be. For individuals that want a party bus in Livonia, there are a number of key considerations to take into account, but we have you covered every step of the way. Not only have we turned the bus into a full on nightclub, but we also understand how to create the perfect atmosphere that will mean that everybody is able to have the absolute time of their life. With our Livonia party bus service, you will notice that we have designed the bus to give you and your guests the maximum amount of space. This means you can invite along more people than ever before resulting in a bigger party and more fun on your part. Throw in a stunning sound system and laser light show, and you have an out of this world atmosphere that just adds that extra something to your party. 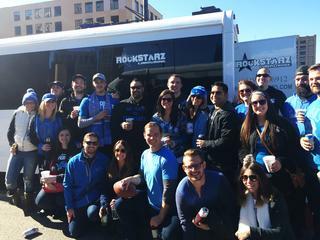 Individuals have used our Livonia party bus rental option for a whole host of celebrations. Whether it be that special birthday or celebrating a particular date, the reason for the celebration is up to you as we will make sure that everybody is able to enjoy themselves no matter the reasons. So, any individual in Livonia who is looking for a party bus can stop their search immediately. By calling us here at Rockstarz Limousine and Party Bus, we can discover your needs and how we can help your night to go off with a bang. Alternatively, you can also contact us via the form on our website and we will be in touch as soon as possible.